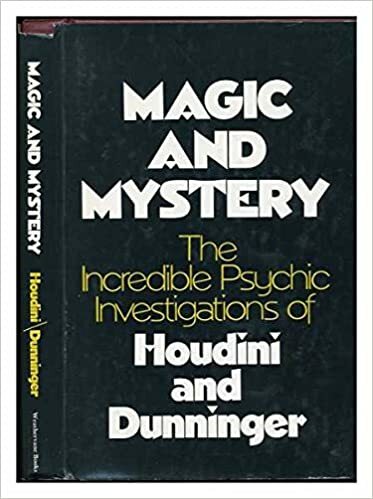 My book review of Magic and Mystery: The Incredible Psychic Investigations of Houdini and Dunninger. Harry Houdini (1874-1926) is remembered as the world’s greatest escape artist. Joseph Dunninger (1892-1975) was a mentalist largely forgotten now but who was extremely famous in the 1930s and 1940s. He was a precursor of The Amazing Kreskin. Both were debunkers of fake spirit mediums. The first half of the book contains articles and letters to and from Houdini concerning “fraud and trickery” among spiritualists “who were preying on susceptible victims.” Dunninger’s own articles on spiritualism represent the second half. Houdini’s manuscripts name names: Pierre Keeler of Washington DC victimized statesmen and their wives, who were very profitable dupes, their “intelligence and sophistication had been no match for [his] versatile trickeries.” We hear of the exploits of the Davenport Brothers, who were among the first to use a cabinet for spirit chicanery shortly after the Civil War. Mrs. Mary Williams and her “materializations.” Henry “Doctor” Slade, the originator of slate writing. Henry Rogers and his typewriter with messages from the illustrious dead. A valuable book on the artifice of spirit mediums and their fakery as revealed by both Houdini and Dunninger. The link to my Amazon Book Review page is HERE.